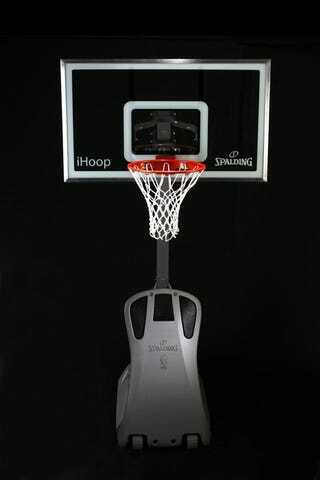 Spalding has finally jumped on the iPod bandwagon (right down to the ubiquitous "i" moniker) with their new iHoop basketball system. Billed as "the ultimate fusion of basketball and music," the iHoop features a built-in sound system that is licensed for iPod use, but should work with any standard MP3 player. The audio system cranks out 30-watts of sound through two 3" ear-level speakers and a 5" subwoofer. The iPod enclosure features five easy access buttons to control the music and a durable enclosure to handle heavy impacts. The sound system is also protected from the elements using "marine grade" outdoor components.